East Chicago, IN - Marino\Ware, a major manufacturer of metal framing components, has installed a Single-Loop Turret Head™ Slitting Line with an Automatic Slit Coil Packaging Line in its new manufacturing plant in East Chicago, IN. 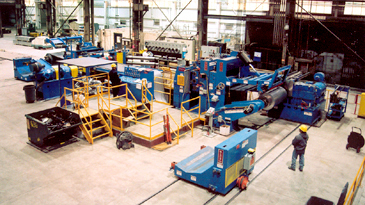 The new slitting line, manufactured by Braner/Loopco, Schiller Park, IL, is designed to process 60,000# x 72" wide coated and non-coated carbon steel coil in gauges from .012" through .250", at line speeds to 1,500 FPM. The Packaging Line automatically handles slit coils up to 10,000# x 24" wide. Wireless Coil Car Control: Entry and Exit Coil Cars are equipped with lightweight "wireless" operator controls that improve coil loading-unloading operations and safety. Elimination of the control cable gives attendants the freedom to select the best viewing positions, while maintaining a safe distance from the Car and coil. Elimination of control cable maintenance is an added benefit. Ultra-Precision Turret Head™ Slitter: The slitting line is equipped with a triple-head Turret Head™ Slitter equipped with three 9.000" quick-change ultra-precision slitter heads that allow Marino\Ware to quickly change heads and consistently produce slit coil with minimal slit edge burr, to width tolerances of +/- 0.002". The Braner/Loopco exclusive Turret Head™ Slitter design features unobstructed access to the slitter arbors, which makes tooling loading and unloading easier and faster than with any other multi-head slitter design. Re-tooled slitter heads are exchanged in less than 2 minutes with no cylinders, chains, or shuttle carts which require maintenance and consume floor space. 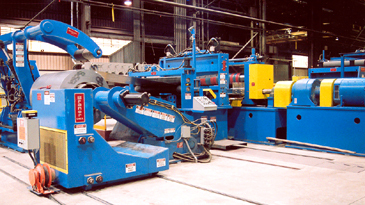 Scrap Handling: A unique scrap system allows Marino\Ware to automatically discharge edge trim scrap into a below-the-floor scrap container. 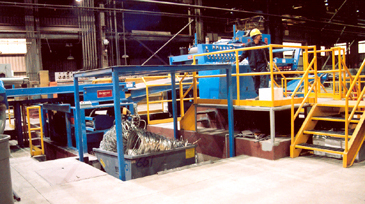 A scrap elevator lifts the scrap container to floor level for quick removal by fork rtuck. Removing the overhead crane from scrap handling duties saves time and improves productivity. The roof of the elevator becomes a floor level platform while the line is running. "Loop-Control Tensioner": A patented Tension Stand with the ability to make adjustments to individual slit strip loops is an integral element of the Marino\Ware Turret Head™ Slitting Line. The "Loop-Control Tensioner" generates the strip tension necessary to wind tight, straight-wall coils while adjusting the depths of individual strip loops, a feature that reduces looping pit depth requirements. In addition, a patented "Duplex" Roll Tensioner with two independent sets of tension rolls designed for processing "oiled" and "dry" surface critical materials is included. 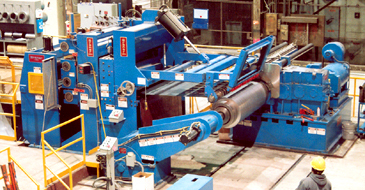 The two sets of tension rolls are mounted in a "quick-change" frame that allows pushbutton tension roll changes in 2 minutes without the aid of pushers, chains, cylinders, or indexing tables.